Johnny Trí Nguyễn (born 16 January 1974; Saigon, Vietnam) is a Vietnamese American actor, stuntman and martial arts choreographer who is mainly active in the Vietnamese film industry. Born in Saigon, Vietnam, Nguyen and his family immigrated to the U.S. when he was 9. He competed as a martial artist on the U.S. national team, and then transitioned into a career as a stuntman in Hollywood, working on films such as Spider-Man 2 and Jarhead. 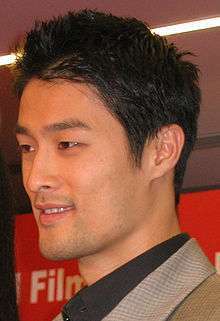 Nguyen later returned to Vietnam and starred in The Rebel, a period martial arts film released in 2007 and directed by his brother Charlie Nguyen. It was a massive success in Vietnam, garnering unprecedented attention for a locally made film. Nguyen followed The Rebel by starring in a steady stream of hit films, many of which were directed by his brother, including Clash in 2009, De Mai tinh in 2010, and Teo Em in 2013, all of which broke box office records at the time of release. In a controversial decision, Vietnamese censors banned Nguyen's 2013 action flick Bui Doi Cho Lon for its violent content. Besides his work in Vietnamese films, Nguyen has had supporting roles in major films from Thailand (Tony Jaa's Tom-Yum-Goong) and India (7aum Arivu and Irumbu Kuthirai). Nguyen got married to his long term girlfriend in 2000 and divorced in 2008. The couple have two daughters. 2003 Cradle 2 the Grave Ling's Henchman Johnny Nguyễn's first American film debut.